Imagine living with an over 45,000 square foot T&T Supermarket at Marine Gateway Vancouver condo project just steps from your front lobby. Convenience has never been more well defined than what the Marine Gateway T&T Supermarket neighborhood will offer its residents. Now a late night at the office won’t be a problem. Just get home on the Canada Line Skytrain, make a quick stop by the Marinet Gateway T&T Supermarket to pick up some fresh groceries and still have time to make the movies at the Cineplex Theatre. It’s all just a short stroll outside your front lobby and on most nights, it’s so close, you won’t even need a jacket! 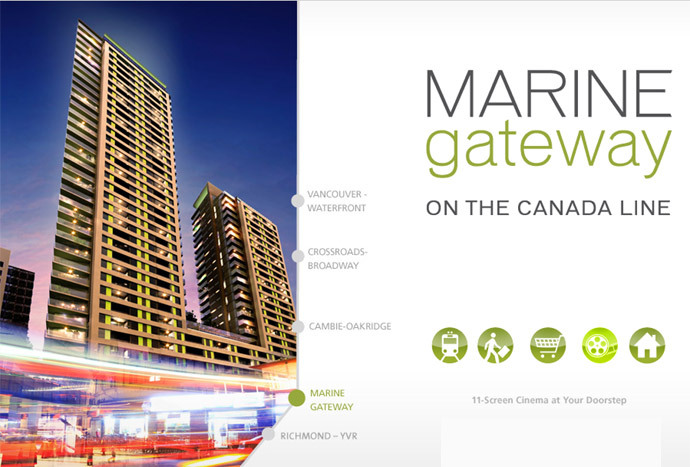 Marine Gateway T&T Supermarket welcomes you to Vancouver’s most promising and exciting new condominium development. Send the Marine Gateway condo sales team your best photo that speaks to “Life On The Canada Line” and win the grand prize of $5000 to Future Shop! Be inspired by where the Canada Line Skytrain takes you or beautiful things that catch your eye on your ride into town. Submit your photos on our Facebook Page by March 5, 2012. The design of the building here a the landmark Vancouver condo towers at Marine Gateway is unsurpassed when it comes to new projects in the Lower Mainland. The proximity to great transit routes and a walkable neighbourhood are coupled with the elegant and unique features of the architecture that is designed by award winning Perkins + Will Architecture firm. The LEED Golf equivalent innovative green design elements at the Marine Gateway Vancouver condo towers are also complimented with Energy Star rated appliances, low emission building materials as well as low VOC paints throughout. There are also two colour palettes to choose from that include Evening (darker) and Matinee (lighter). The living rooms at the new Marine Gateway Vancouver condo tower will feature heritage oak wood laminate floors in addition to deluxe low VOC carpeting in the bedrooms and stain chrome finish door handles. The bathrooms at the new Vancouver Marine Gateway condos for sale will introduce dual flush water conserving toilets, Kohler fixtures, under mounted sink by Kohler, ceramic tiled backsplash oversized vanity mirror and elegant/durable cabinets complimented with elegant laminate wood cabinetry (colour depending on the palette that you choose). The kitchens at the new Vancouver East Marine Gateway condos for sale will include stylish Kohler stainless steel flush mount sink, ceramic backsplash (tiled), granite counters and Panasonic microwave built in with trim. Also presented in the East Vancouver Marine Gateway condo kitchens are seamless matching high-end front paneled fridge and dishwasher, invisible hood fan by Faber, Blomberg bottom freezer fridge with four spill proof glass shelves and wine rack as well as a Blomberg stainless steel electric range stove top. The kitchens at Marine Gateway condos in Vancouver East real estate development will also feature elegant laminate wood cabinetry with silent soft touch closures. Some of the great Marine Gateway Vancouver condo amenities include the breathtaking panoramic views of the downtown city skyline, Fraser River, ocean and the North Shore and interior mountain ranges. Many of the suites on the higher floors especially the penthouses and sub-penthouse suites at the Vancouver Marine Gateway condos for sale will have the most impressive views towards all directions when compared to other condominiums in the East Vancouver real estate neighbourhood. In addition, other new Vancouver Marine Gateway amenities include the urban dining lounge and social rooms in addition to a deluxe catering kitchen, large formal dining room as well as a television/movie lounge and other recreational amenity spaces. The Marine Gateway condo towers will also introduce an outdoor rooptop terrace deck as well as a children’s play area and BBQ sets for outdoor entertaining. There is a live in caretake on site as well as underground parking garage that is bright and secure, as well as separate from the retail/commercial space. There is also bike storage lockers and a Bike Mobility Centre (Bike Hub) for repairs and servicing. In terms of the East Vancouver real estate location of the Marine Gateway condo towers, home owners will be greeted to a centrally located, well positioned home that is close to everything. Firstly, top ranked schools such as Churchill Secondary, Laurier Elementary, Quilchena Elementary (French immersion), Gordn Elementary (French Elementary) are all close by to the new Vancouver Marine Gateway condo towers. There are also many private schools, Langara College and UBC, which are just minutes away from the new Marine Gateway Vancouver condo towers. The new East Vancouver real estate district will also be very convenient when it comes to public transit. The Canada Line SkyTrain station along Marine Drive and the South Vancouver Bus Exchange are just seconds away from your new Marine Gateway condo in Vancouver East. 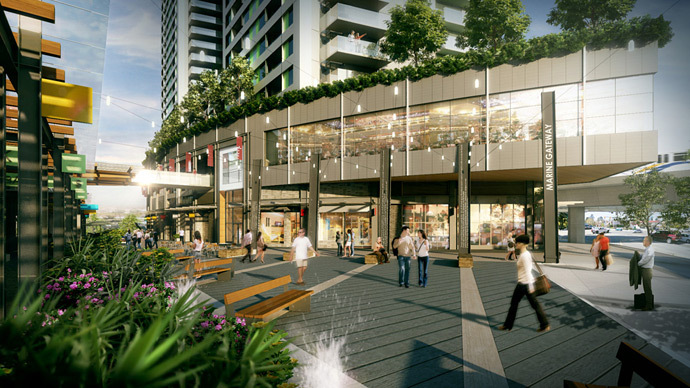 Also nearby are services, shops, banks, coffee stores, restaurants and the High Street Plaza level. Other amenities nearby the new Marine Gateway Condos in Vancouver East real estate market include a drug store, grocery store (recently announced as the Marine Gateway T&T Supermarket) as well as a Cineplex Theatre. Also, home owners at the new Marine Gateway Vancouver East condos will be five minutes from Richmond, nine minutes from YVR, thirteen minutes from Yaletown and fifteen minutes from downtown Vancouver. Also nearby are a number of top ranked golf courses.